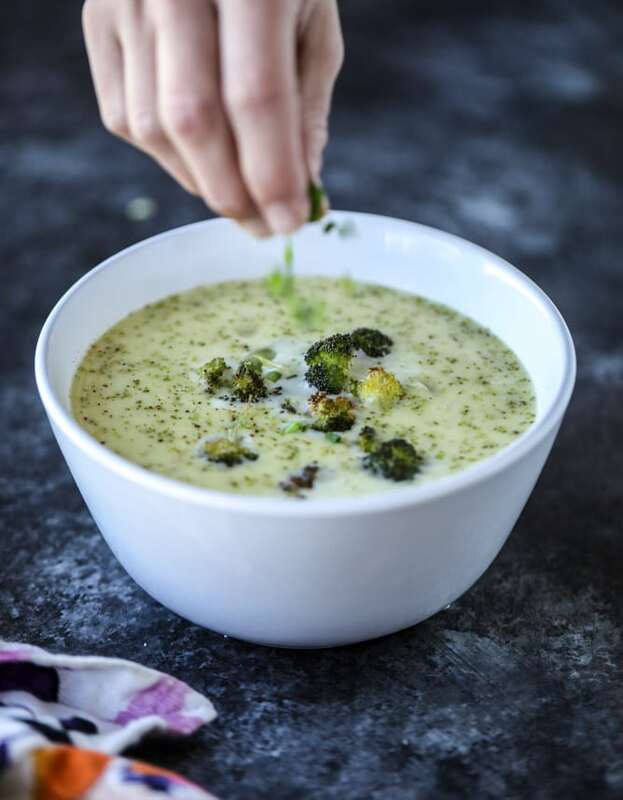 I feel like we could definitely call this broccoli fondue soup. I almost did! Soup that tastes like fondue? Sign me up. That’s enough to get me into broccoli cheese soup. How about you? It’s no secret that growing up, I did NOT like vegetables. I mean, it’s no secret that four, three, even two years ago, I barely liked vegetables. I still struggle with vegetables! My constant battle is to make dishes that actually make me WANT to eat veggies, and well, now that’s super important because I want Max to also want to consume them. 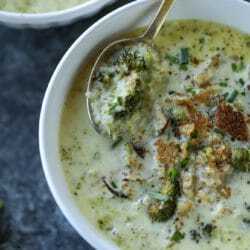 Even though veggies were not the first thing on my list as a kid, for some reason, I was always drawn to broccoli cheese soup. Could it have anything to do with the outrageous amount of cheese in said soup? PROBABLY. Cannot help it. Such a cheese freak! Hence my insane love of fondue. My mom instilled it in me at a very young age! Also helping the fact was that many places serve broccoli cheese soup in a bread bowl. Oh my heavens. That’s just such a fabulous way to take everything over the top. 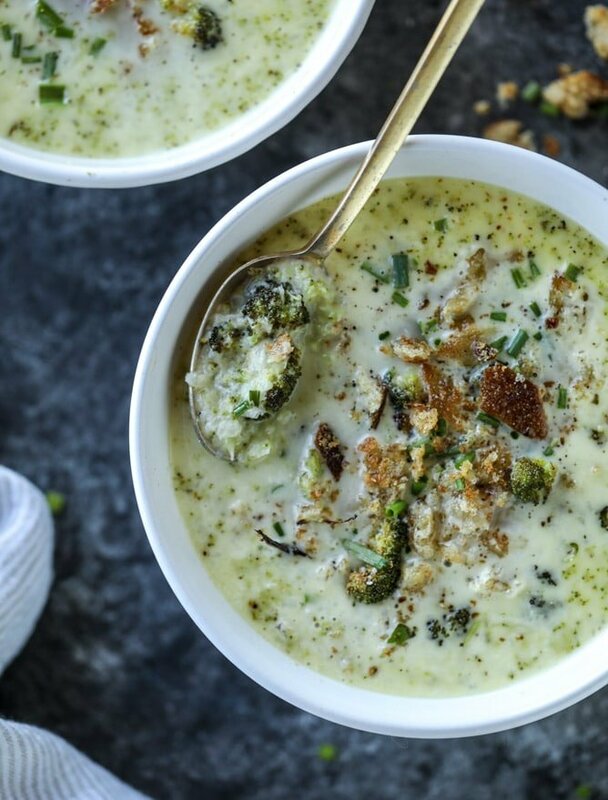 I wanted to make a newer version of broccoli cheese soup, similar to one I shared in my first cookbook, Seriously Delish. Here, we not only roasted the broccoli first (which is the best and only way to consume said little adorable veggie trees! ), but I also swapped the cheese. I used a gruyere cheese for perfect meltiness with a hint of parmesan, and heck yes, it does taste like fondue. Majorly divine and creamy! The swiss cheese flavor is different in the best way possible. 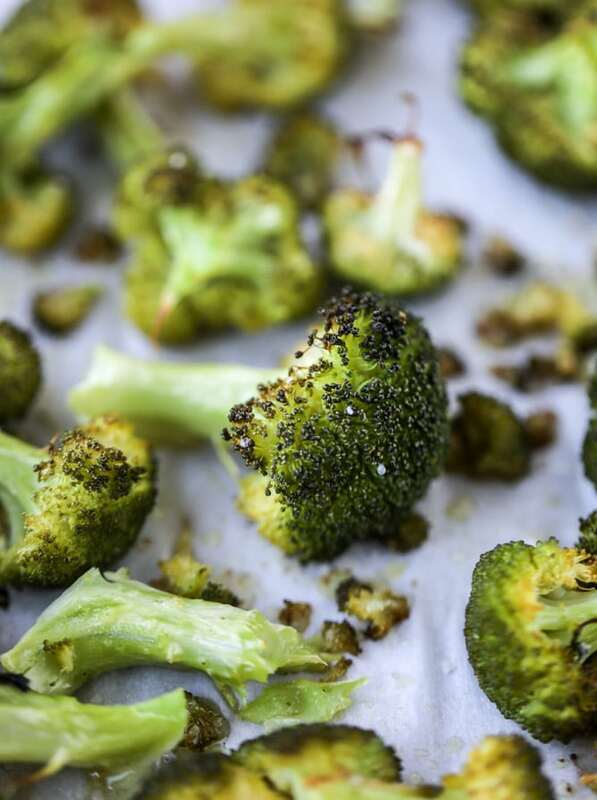 I used my KitchenAid® Wall Oven to roast the broccoli florets to perfection! While I am known to char my veggies into oblivion, I didn’t want to over-roast these and make my soup taste like an ashtray. I made sure to roast them just until they were slightly crisp and golden brown and I cannot say enough amazing things about how evenly this oven cooks! I knew that by throwing the florets in there at 400 degrees for a few minutes, I would not end up with a burnt and blackened mess. The broccoli came out perfectly – just toasted enough to add a bit of golden flavor to the soup. And the oven heats up SO quickly. I love not having to wait a million years for it to preheat. Okay, here’s the thing. 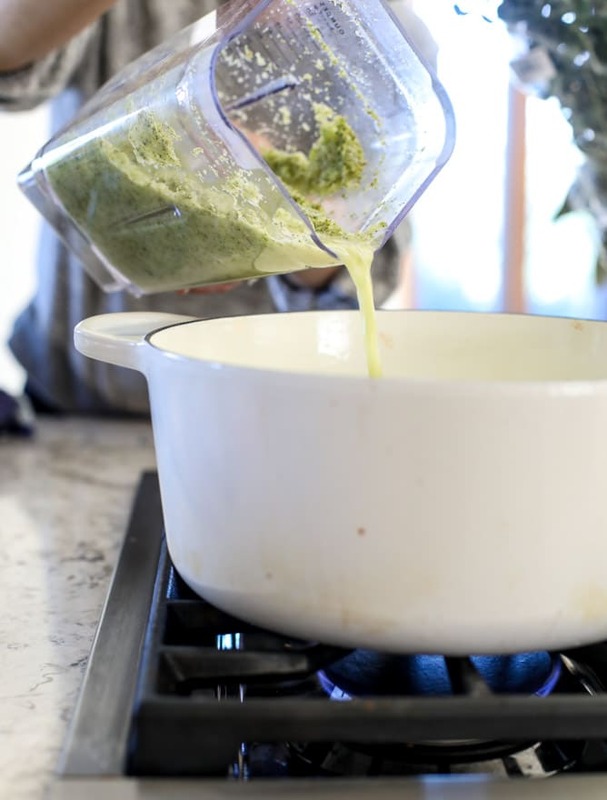 I know that broccoli cheese soup usually isn’t blended, but I used my KitchenAid® High Performance Series Blender for a few reasons! First, you guys know I have been OBSESSED with KitchenAid® Blenders for months now, and this model is unlike any blender I’ve ever used. It blends everything perfectly and usually in one go-round. So, first up, I didn’t want big broccoli chunks in my soup because even though I really like broccoli cheese soup? It’s still broccoli. Which I don’t 100% love. The number of times I’ve written that out on this space on the internet is probably too many to count. Ooomph. So what I did here was blend up the base with MOST of the broccoli pieces, leaving a few for topping and stirring in for that classic crunch. This was the perfect base for me. The other reason I wanted to blend it was so it had more of a “bisque”-like consistency! Smoothy and silky, even before adding the cheese into the pot. Oh yes. Just like a dream. With one quick blend (and a towel overtop to make sure I didn’t have a hot soup explosion in my kitchen! ), the base was pureed and creamy and the perfect thickness for cheese to be stirred in. After the blend, I poured the hot soup back into my pot on my KitchenAid® 36-inch, 6 burner Gas Rangetop and kept it over the lowest heat. 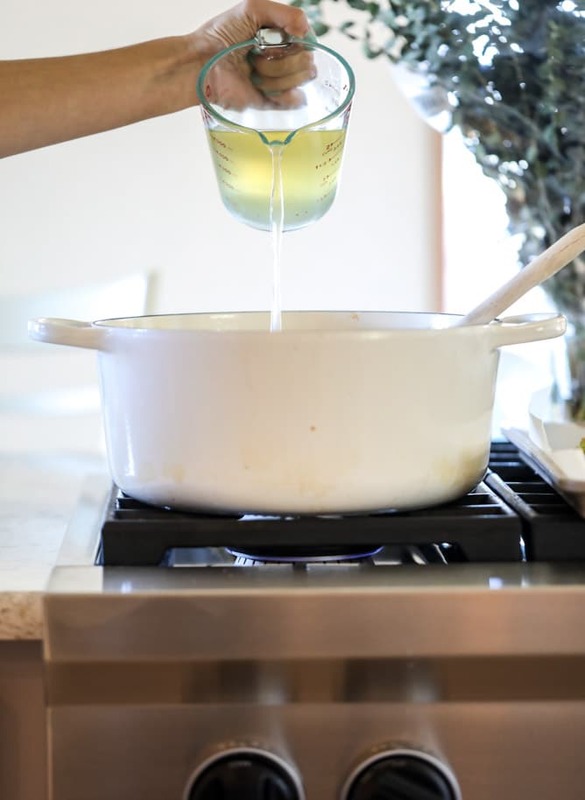 In order to get that super creamy consistency that doesn’t separate, you want to add the cheese in small handfuls and stir until every last bit melts before adding more. This rangetop makes it super simple because the heat is even under the pot the entire time. One side isn’t hotter than the other, which was a major problem of mine before. I also used the rangetop to toast up some garlic brown butter croutons which only take minutes! They are exactly what they sound like: torn bread pieces in butter that browns with garlic. Throw that skillet over medium to low heat and you’re good to go within minutes. Crispy, golden, crunchy bits that make for a perfect texture on top of your soup. And you know me, the texture freak. This soup is so creamy and wonderful and comforting. I love that it’s such a stand out meal in the month when we taste a lot of the same things: roasts, big dinners, cookies, cocktails. Making this for dinner is such a lovely change of pace. ¼ cup crumbled and torn bread pieces as small or large as you’d like! Preheat the oven to 400 degrees F. Line a baking sheet with parchment paper. 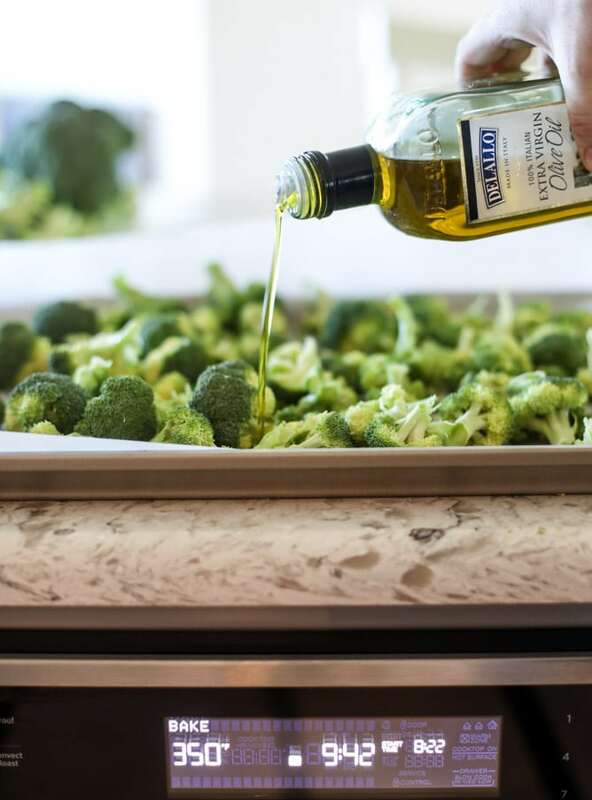 Place the broccoli florets on the sheet and drizzle with olive oil. Sprinkle with salt and pepper. Roast for 15 to 20 minutes, until the florets are just golden brown and not overly charred. While the broccoli is roasting, heat a large stock pot over medium-low heat and add the butter. Stir in the onions and garlic with a pinch of salt and pepper. Cook, stirring often, until the onions are translucent. Stir in the chicken stock. Once the broccoli is finishing roasted, stir in about ¾ of it (leave some to garnish the top with). 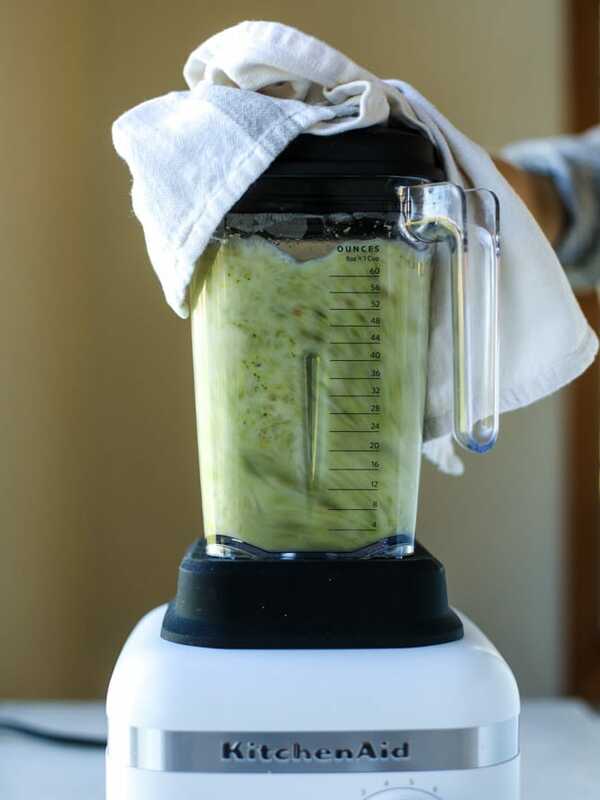 Transfer the mixture to a blender and very carefully blend until the mixture is pureed, holding a towel on top of the lid to keep it secure and safe. Pour the mixture back into the pot over and head over low heat. In a shaker bottle, add the flour to the half and half and shake it well for 30 seconds to create a slurry. Slowly pour the mixture into the soup base while stirring. Let it cook for 2 to 3 minutes, stirring, until the mixture slightly thickens even more. 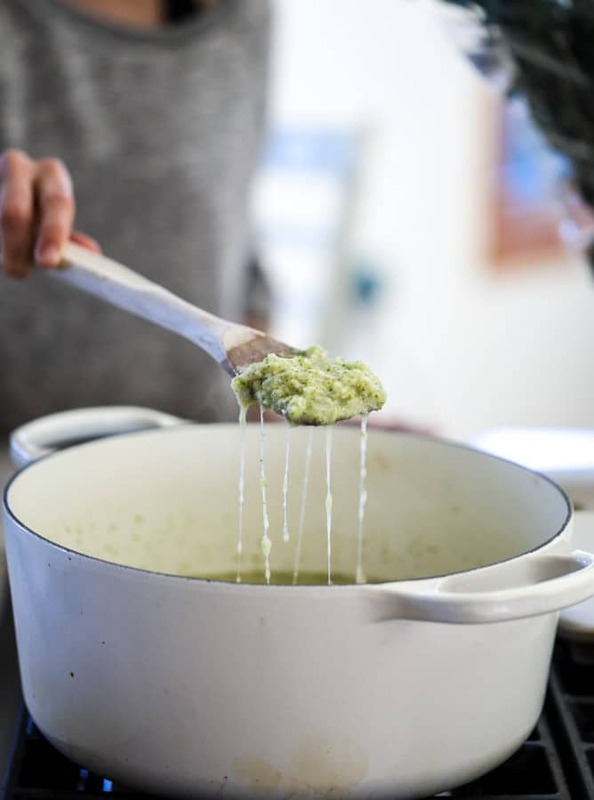 Keep the soup over low heat and very gradually stir in small handfuls of cheese until they melt completely. Stir in the parmesan cheese too. Taste the soup and season it with more salt and pepper if necessary. 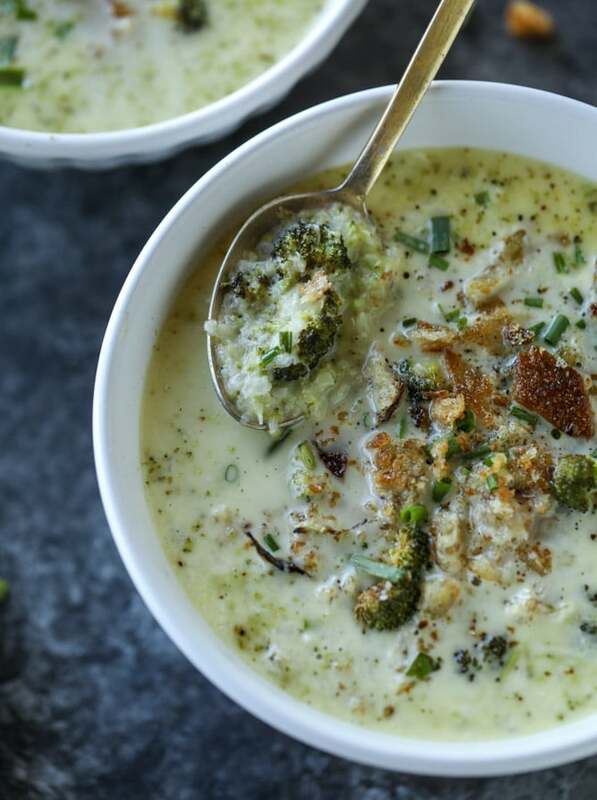 Serve the soup immediately with a sprinkle of chives on top, some of the leftover roasted broccoli and the garlic breadcrumbs! But maybe now… one more cookie. life with max: three years old! This combination sounds really good! Thanks in advance! Best Regads! yes! this blender can do everything – it’s incredible! Goodness, this sounds incredible. 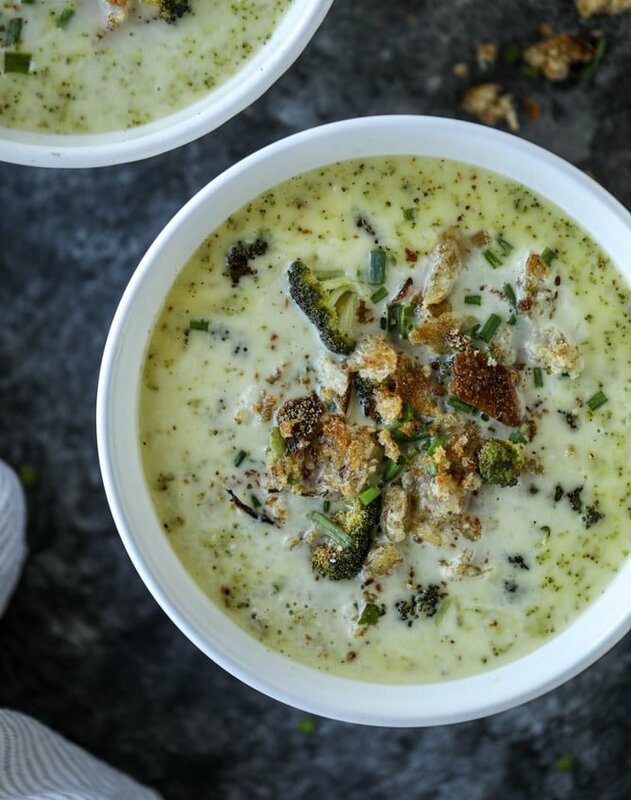 I love how you’ve dressed up broccoli cheddar soup — and it tastes like fondue? Pass me a bowl! This sounds wonderful, but, it is hard to find Gruyere Cheese here, what can I substitute for this that will have the same texture and flavor? Also, I love the KitchenAid line of appliances!!!! can you find just a regular swiss cheese?? that would work! This looks delicious! Your white dutch oven is so beautiful, and I’ve been thinking about getting one in that color but am worried about keeping it clean. Do you find that it cleans as well as other colors? Or does it stain easily? Thanks!! it cleans GREAT!! i was just talking to my mom about this yesterday (she got it for me for christmas last year) and it’s amazing – i make everything in it, even tomato sauce based things. sometimes i have to use baking soda on it, but it still looks brand new and i use it multiple times per week! That is such great news!! Thank you!! Oh my goodness, I cannot wait to make this! I love how rich and comforting it sounds while still making broccoli the star. LOVE! If I was to do an immersion blender, would I use it still when you would put it in the blender? Where are the directions for the garlic breadcrumbs? At least on mobile, they do not show. There’s an ad where further directions should be! OMG this sounds and looks amazing! Broccoli and cheese are just a perfect combination. I just made brocoli cheese tops and that proved it. Hi, what are the instructions for the garlic breadcrumbs? assuming just roast in the oven but would love to know for sure. Thank you! This looks delicious. Merry Christmas! I just made the version in your first cookbook and though the flavor was okay but it wasn’t cheesy, the Swiss cheese was just in huge blobs.. any idea why this happened? Like others, I don’t see the directions for making the garlic breadcrumbs. I assume you brown the butter then toss the bread, bake maybe? Thanks! Huge lover of broccoli cheese soup, and this did not dissapoint. Love the taste that the roasted broccoli brings to the soup. At first when I tasted the finished soup I thought the gruyere was going to be too rich, but after it cooked for a bit and I let it sit on the stove for about an hour before we ate, it was perfection. THank you again for another great recipe.